LA ROCHE DE MESGOUEZ, TROILUS DE, Marquis de La Roche-Mesgouez, in Brittany, viceroy of New France, founder of the outpost on Sable Island in 1598; baptized 30 June 1536 at Landerneau, France, son of Guillaume de Mesgouez and Françoise Lampyer; d. 1606 in France. At 13 La Roche was a page at the court of Henri II. Subsequently, having won the favour of Catherine de Médicis, he was in turn made a chevalier, a captain, and a counsellor of state. In 1565 he became governor of Morlaix (Brittany). This position opened his eyes to the profits brought to Saint-Malo by the fisheries and the fur trade on the American coasts, and suggested to him that he should undertake the “exploitation” of the “Terres-Neuves.” In March 1577 he obtained from Henri III a commission allowing him to appropriate to himself the territories “of which he could make himself master.” On 3 January of the following year a second commission made him the first holder of the title of viceroy in New France, and granted him the right to govern the country. With the assistance of Honorat de Bueil, the vice-admiral of Brittany, and the co-operation of a few shipowners, he fitted out a ship and a pinnace for his undertaking. But recalling that in 1575 he had had dealings with James Fitzgerald, an Irish rebel who according to certain authors was a pretender to the Irish throne, England suspected him of wanting to assist the Irish insurgents. Four British vessels captured his ship, probably in June (1578), while the pinnace escaped. In 1583 a trading voyage under Étienne Bellenger, of which the expenses were met by Cardinal Charles de Bourbon and Anne de Joyeuse, Admiral of France, was a financial success. Encouraged by this example, La Roche, with their support, organized a second expedition, in association with some shipowners of Saint-Malo and Saint-Jean-de-Luz. He set sail from the latter port at the beginning of 1584 with a flotilla carrying 300 men, but his principal ship sank off the coast of Saintonge, and this put an end to the expedition. During the civil war between Roman Catholics and Huguenots, which deferred any resumption of his plans, La Roche rallied to the side of Henri III and Henri IV against the League. In 1589 he exchanged his governorship of Morlaix for that of Fougères, north of Rennes. While on his way to defend the town, he fell into the hands of the Leaguers at Sablé; their leader, the Duc de Mercœur, kept him a prisoner for seven years in the castle at Nantes. He was finally freed in 1596, on payment of a ransom, and “seeing himself without a command” he went back to his plan for developing trade across the Atlantic. On 16 Feb. 1597 Henri IV granted him “authority” to undertake a new expedition. La Roche, on 4 March, signed an agreement with Thomas Chefdostel, captain of the ship Catherine, under the terms of which the latter piloted to America an exploratory mission commanded by Capt. Kerdement. The marquis, satisfied with the information thus obtained, received new letters patent from the king, dated 12 Jan. 1598, appointing him lieutenant-general of the territories of Canada, Newfoundland, Labrador, and Norumbega. These letters granted him title to the area and the monopoly of the fur trade, and forbade all others to trade in furs without his consent, on pain “of losing all their ships and merchandise.” They further authorized him to recruit hardened criminals for his undertaking. From the prisoners delivered to him La Roche chose those who possessed “considerable means,” and offered them the opportunity of purchasing their freedom for a large sum, which he sometimes set at 500 écus. The courts, when informed of how justice was being cheated, refused all further requests for prisoners. La Roche then got the Parlement of Rouen, on 16 March 1598, to hand over to him 250 “vagabonds and beggars.” Among those who agreed to make the voyage he selected some 40 of the most vigorous, to whom he attached about 10 soldiers. They embarked on two ships, Chefdostel’s Catherine and Capt. Jehan Girot’s Françoise, which took them to the Île de Sable (Sable Island); La Roche rebaptized it the Île de Bourbon in honour of François de Bourbon, Duc de Montpensier, governor of Normandy. The viceroy settled his party on the north coast, on a small waterway forming a narrows which he named the Boncœur River. There he built living quarters, and a storehouse in which were placed provisions, clothes, tools, arms, and furniture. Leaving the post under the orders of a commandant, Querbonyer, La Roche accompanied the ships to the Newfoundland fisheries. According to an agreement previously concluded, the profits from the fishing were to go to the ships’ captains, whereas the furs exchanged on the spot were to be divided, two-thirds being given to the captains and the remainder to the viceroy. On their return trip at the beginning of September a violent storm prevented the ships from calling at the island post and drove them straight to the French coast. Following the report that the marquis made of his voyage to Henri IV, the king promised, as a subsidy, to “grant him one écu for each barrel of merchandise coming to and being loaded in the ports of Normandy.” Thanks to this subsidy, which over the years was to bring in 12,000 écus, La Roche maintained his settlement. 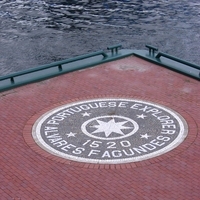 Each spring he had it supplied by Chefdostel with “wine, coats and clothing”: the deportees got their food from the fish and game available locally as well as from the cattle that had been landed on the island, probably by the Portuguese Fagundes around 1520. At the same time they cultivated “French gardens,” which supplied them with vegetables. Meanwhile, on 22 Nov. 1599, the Huguenot shipowner Pierre de Chauvin de Tonnetuit, of Honfleur, managed to obtain a commission similar to La Roche’s. In the face of the latter’s protests Henri IV issued new letters patent on 5 Jan. 1600, by which Chauvin was only “one of the lieutenants” of the viceroy, with fishing rights from the Gulf of St. Lawrence to Tadoussac, where he soon set up a post with François Gravé Du Pont. In 1602, for an unknown reason, La Roche did not dispatch the annual supply of wine and clothes. It seems likely that complaints on this score, as well as about the administration of Commandant Querbonyer and Capt. Storekeeper Coussez, reached the court in the autumn. To counter them, on 21 Feb. 1603 the viceroy instructed Chefdostel to go and take supplies to the post and to bring back Querbonyer, Coussez, and three other persons. In addition, Chefdostel was to take a commissioner there, whose task was to inquire into the island’s resources in order to give the king information relevant to a plan for making it into a reliable and suitable colony. 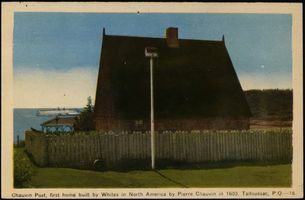 During subsequent years the viceroy appears to have kept and utilized his establishment in America: after the foundation of Port-Royal (Annapolis Royal, N.S. 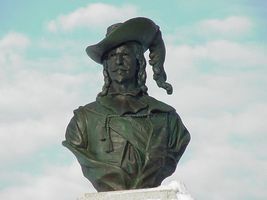 ), he wrote in 1604 that Dugua de Monts was not “in full view of everyone as I am on the Île de Bourbon.” That same year, in a mémoire to the king, he requested payment of the grants and dues to which he was entitled, and at the same time offered to fortify all the harbours from Labrador to Port-Royal. Henri IV remained deaf to this appeal. Without apparently obtaining any satisfaction, La Roche died in the year 1606. ASM, B, Parlement de Normandie, archives secrètes. Bibliothèque de l’Institut de France, Coll. Godefroy, 291, Escrit envoyé par le marquis Troille de Mesgouez de La Roche (1604), Bréard, Documents relatifs à la marine normande. Cartier, Voyage de 1534. Champlain, Œuvres (Laverdière). Hakluyt, “Discourse on western planting.” Lescarbot, Histoire (Tross). Biggar, Early trading companies. N.-E Dionne, La Nouvelle-France de Cartier à Champlain (Québec, 1891). Édits ord., III. É.-H. Gosselin, Nouvelles glanes historiques normandes. Gustave Lanctot, “L’établissement du Marquis de La Roche à l’île de Sable,” CHA Report, 1933, 33–42. La Roncière, Histoire de la marine française, IV. Joseph Le Ber, “Un document inédit sur l’île de Sable et le Marquis de la Roche,” RHAF, II (1948–49), 199–213. D. B. Quinn, “The voyage of Étienne Bellenger to the Maritimes in 1583: a new document,” CHR, XLIII (1962), 328–43. Arch. Départementales, Finistère (Quimper, France), “État civil et généalogie,” Landerneau, Saint-Thomas, 30 juin 1536: www.archives-finistere.fr (consulted 15 Nov. 2018). Gustave Lanctot, “LA ROCHE DE MESGOUEZ, TROILUS DE,” in Dictionary of Canadian Biography, vol. 1, University of Toronto/Université Laval, 2003–, accessed April 19, 2019, http://www.biographi.ca/en/bio/la_roche_de_mesgouez_troilus_de_1E.html.